A total removal of the bacterial deposits is one of the main challenges of periodontal therapy. A surgical approach is sometimes required in order to allow a correct access to the areas not thoroughly reached during the initial therapy. The present study focuses on the surgical scaling effectiveness in root deposits removal; the potential support of a disclosing agent during this procedure is also evaluated. Forty surgical periodontal patients were randomly divided between surgeries where the operator was informed about a final examination of the residual root deposits and surgeries where the operator was not informed. Straight after scaling procedures a supervisor recorded the O’Leary Plaque Index of the exposed roots by mean of a disclosing agent and the percentage of teeth with residual biofilm. After the stained deposits removal, a second chromatic examination was performed and new data were collected. Mann-Whitney U-test and Wilcoxon test for paired samples were used for comparisons respectively between the two surgery groups and the first and the second chromatic examination; one-sided p-value was set at 0.05. At first examination no significant differences between the two groups were observed regarding Plaque Index (p=0.24) and percentages of teeth with residual biofilm (p=0.07). The 100% removal of roots deposits was never achieved during the study but a significant reduction of 80% of root deposits was observed between first and second examination (p=0.0001). Since root deposits removal during periodontal surgery resulted always suboptimal, the use of a disclosing agent during this procedure could be a useful and practical aid. 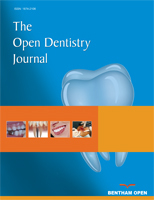 Keywords: Disclosing agent, biofilm, periodontal surgery, scaling and root planing. © Montevecchi et al. ; Licensee Bentham Open.